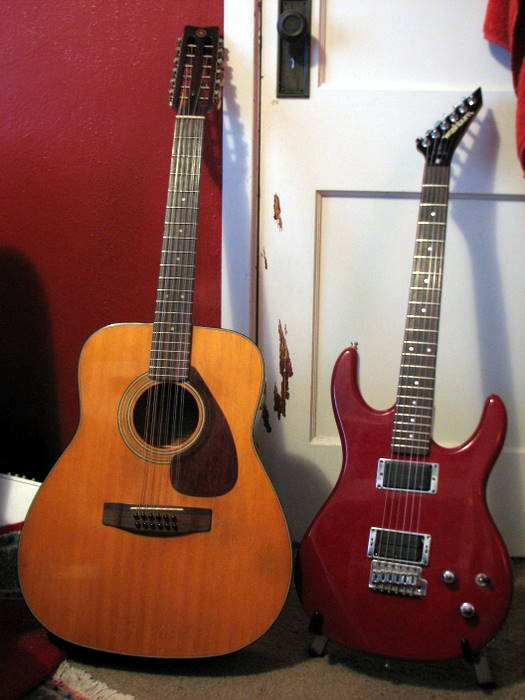 I got a 1973 Yamaha FG-260 12-string acoustic (same kind recorded on Boston’s “More Than a Feeling”) from my stepdad and a 1986 Washburn G-IV electric from my uncle Dan Sweeney. They’re both great guitars, definitely more than a beginner could hope for. The electric is fresh from a tune-up at the luthier’s, so the action is great all over, and it’s in great shape. So now comes learning the darned instrument, which is going well so far. It’s definitely intimidating going back to the absolute basics with one instrument after being a drummer for 13 years, but I’m already to the point where I can have fun with stuff instead of wondering how the heck this thing is supposed to make music. I’ve got the electric set up to interface with my MacBook Pro, so I can mess with all of the amp modeling and effects in Logic and GarageBand. My roommate Eddie let me borrow an old amp of his as well. So I’m set up pretty well as far as learning guitar goes. In addition to that, my roommate Eddie and I converted our seldom-used dining room into a music room, because we and our other roommate Jeff want to start playing blues together on a regular basis. So we now have one room with V-Drums, a piano, and rigs for both guitar and bass. The room’s nice and spacious, so it’ll be accessible for practice and for parties and such. And having the V-Drums in there will be a total lifesaver for everyone’s ears, just like they were for Deliver Me Seven rehearsals. Cool, that washburn kind of reminds of an old Dean Zelinsky model. Personally, I’m more in to his new stuff.